Tellus Dishes | Just Shooting Memories! This past Friday evening was Family Science Night at the Tellus Museum. 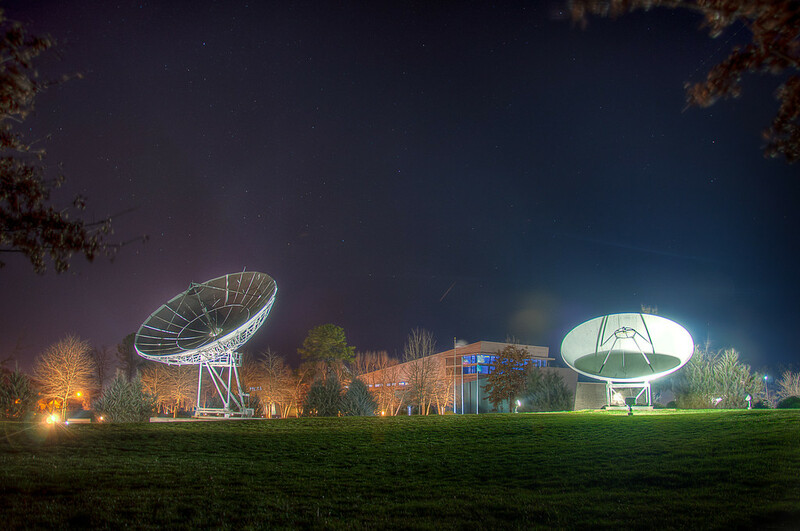 It was tons of fun, but the best part is that I got to run around for a few minutes afterward taking some shots of the satellite dishes. Okay, that was not the most fun part, watching the kids build stuff and play on the heavy machinery was better. Back to the satellite dishes. As we pulled into the parking lot, I noticed that they were lit up nice and bright and I set about trying to get a good angle. When I shot this one, I was not expecting to get a small meteor, but if you look just above the museum, it is there. If I could figure out how to read the Fireball Camera information, I might be able to find it’s track through NASA.